Q. How do I cite an organization's website? for example, the United Nations or an NGO? If you are using an online bibliographic referencing tool, then select to create a reference of type "Webpage"-- and put in the link. UN Refugee Agency. 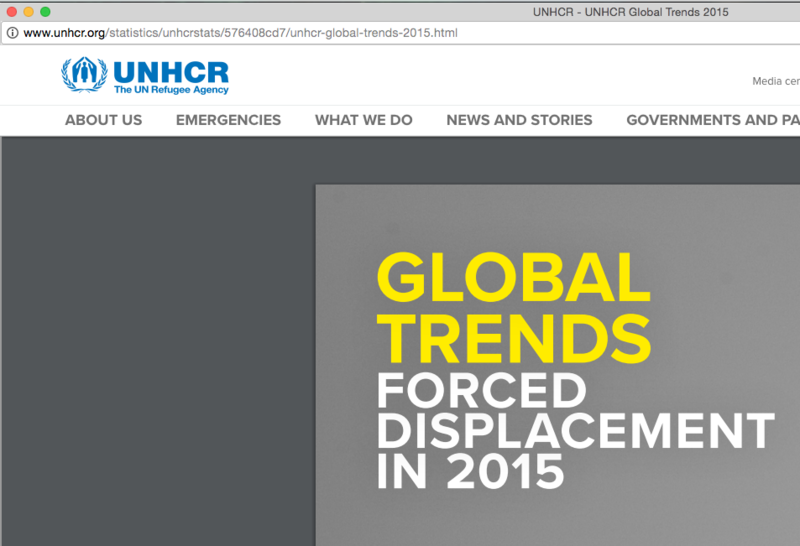 “UNHCR Global Trends 2015: Forced Displacement in 2015.” The UN Refugee Agency, UNHCR, 2015, http://www.unhcr.org/statistics/unhcrstats/576408cd7/unhcr-global-trends-2015.html. Accessed 19 Jan. 2017. The UN Refugee Agency estimates that 65.3 million people were forcibly displaced in 2015. Over 65.3 million were forcibly displaced in 2015 (UN Refugee Agency).